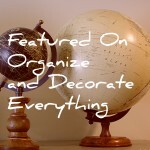 Purse Organizer | Welcome to the Creative Collage - Come In and Stay Awhile! 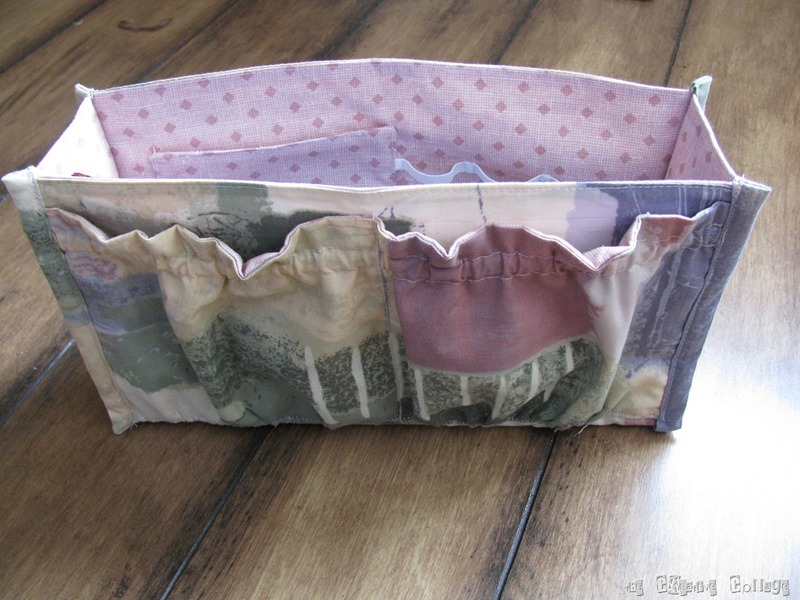 Knock Off Purse Organizer and Giant Cupcake! Our school held an annual fundraiser on Friday night. 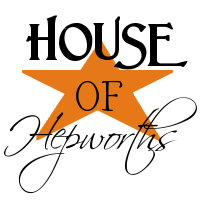 Each school family is required to donate 2 items to be auctioned off. This is along with the list of businesses that each family contacts for donations. Usually there is A LOT of stuff. It is always hard to know what to bring. Some things you wouldn’t think would bring much go outrageously high and others, that are worth more, bring what they are worth and nothing more. Each classroom also does a themed basket which is then auctioned off. 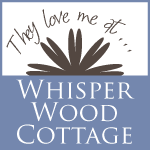 Things like a camping basket, a Lego basket, Rainy Day craft basket, Board games, etc. etc. My oldest son’s class did a farming basket – very appropriate because we live in a farming community and we’re farmers! My husband and I made fence, an open shed and a feed bunk. I usually try to make a shaped cake of some sort. 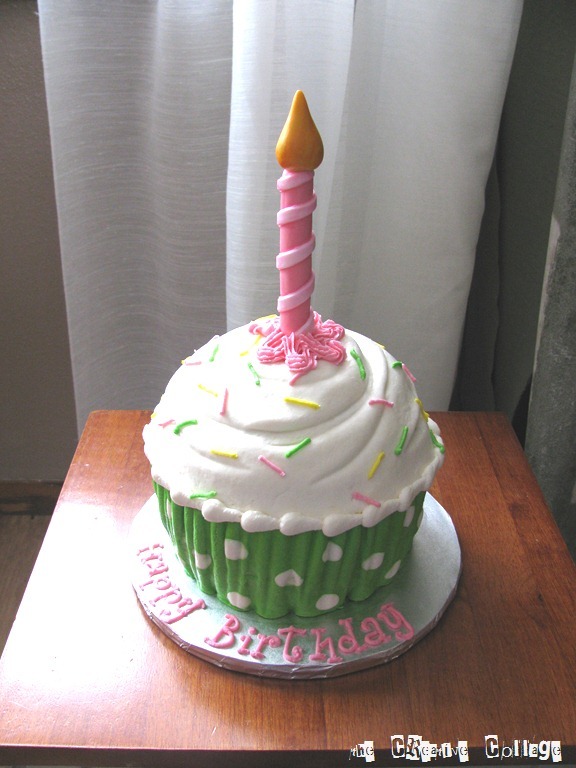 This year – in honor of one of the teacher’s birthday, I made a large cupcake. It was 6” around and about 12” tall with the candle on top. It did really well, and the teacher was very appreciative. The other thing I made was a last minute addition after the T-ring I let over rise did a nosedive! 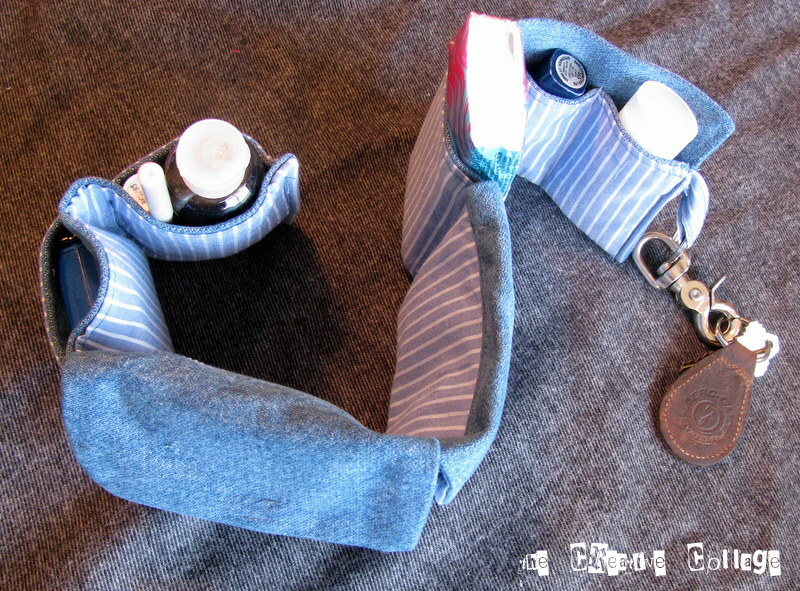 So, Friday afternoon, I started on a knock off version of the PortaPockets purse organizer. And because I had to get it done and I had so little time, LOTS of things went wrong! My craft room looks like a tornado hit after all the rushing around, so looks like that will be one of the things on my list of things to do! This is how it turned out – not too bad for just winging it at the last minute. If I had to do it again, I would probably change a few things, but all in all, acceptable. I hope to make another one for myself and possible put it on the list of things to give as teacher gifts next Christmas. Of course, I will need to actually write down the steps so that I can duplicate it next year! Handbag and Organization that works for me! I have ventured into sewing my own handbags the last little bit. I used free patterns off the internet and though the patterns are cute, they weren’t functioning exactly as I wanted. The purse I made last year to go with a brown coat had to be adjusted because the top of the purse was too wide. I added a couple pleats on each side and that made it work. This year – when I picked up a different winter coat at Goodwill for $5.00 I needed a matching purse and I wanted to try a little different pattern. 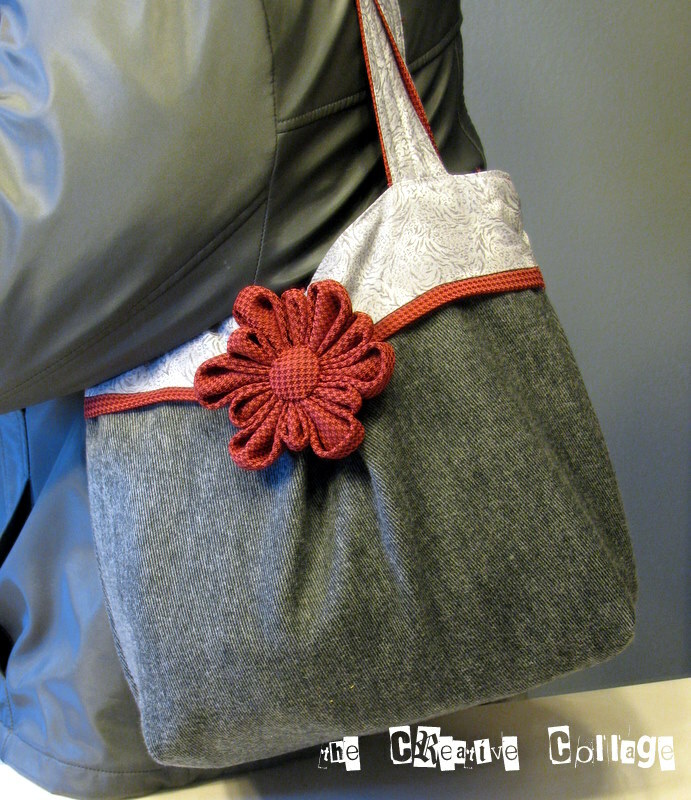 I had made a purse that would’ve worked with the gray awhile back but it wasn’t deep enough to hold all my stuff! The straps were also not long enough to wear over the shoulder and I felt a little bit like an old lady with it hanging over my forearm! Plus, it was hard to grocery shop. I picked up the material from Walmart in the $1.50 a yard. I didn’t even use half of each material so the purse was under $5.00 for sure. And this is what I ended up with. It measures about 11″ wide, 10″ tall and 4″ deep. It has a boxed bottom which I found I prefer to hold more stuff and sit flat! 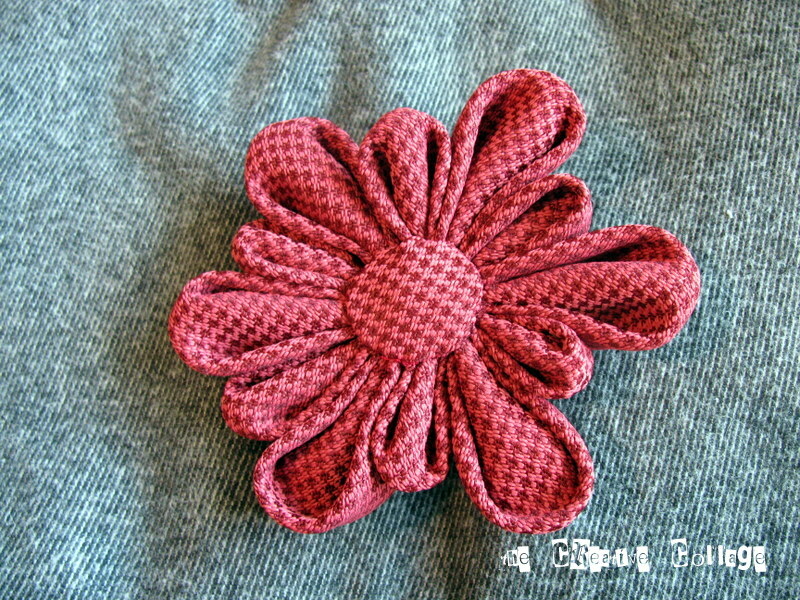 I have been loving the fabric flowers in blogland and wanted to try my hand at one. The material I used was rather heavy for this flower. I found the tutorial at Gone to Earth. She used a cotton so hers looks more “crisp”. But I don’t mind how it turned out. I improvised with the center, just making a fabric yo-yo and sewing it on the front. I also did a yo-yo for the back and sewed on a brooch clip so it is movable. I am still debating on where I can put it on the bag. What do you think? So, now for the “stuff” that prompted the bigger bag! I made everything using different tutorials from around the web and improvised to fit what I carry with me. 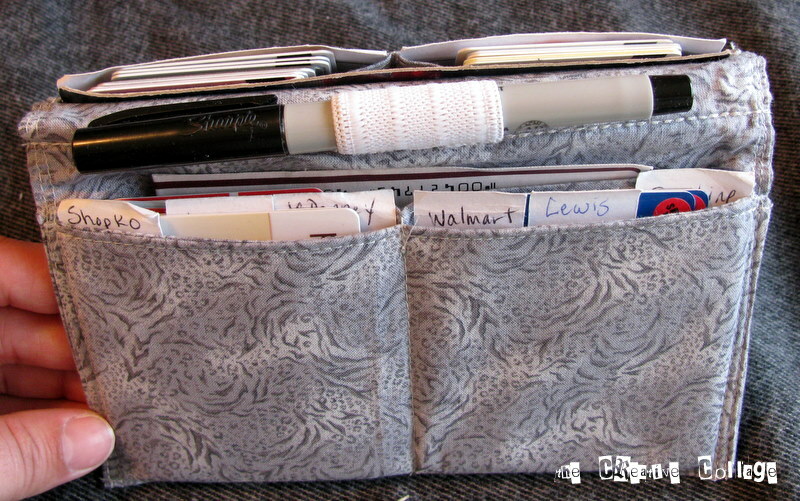 A purse organizer, a coupon organizer, a checkbook cover and a gift card holder. The purse organizer carries lotion, lipstick/chapstick, hand sanitizer, a tape measure (as any good DIYer has! 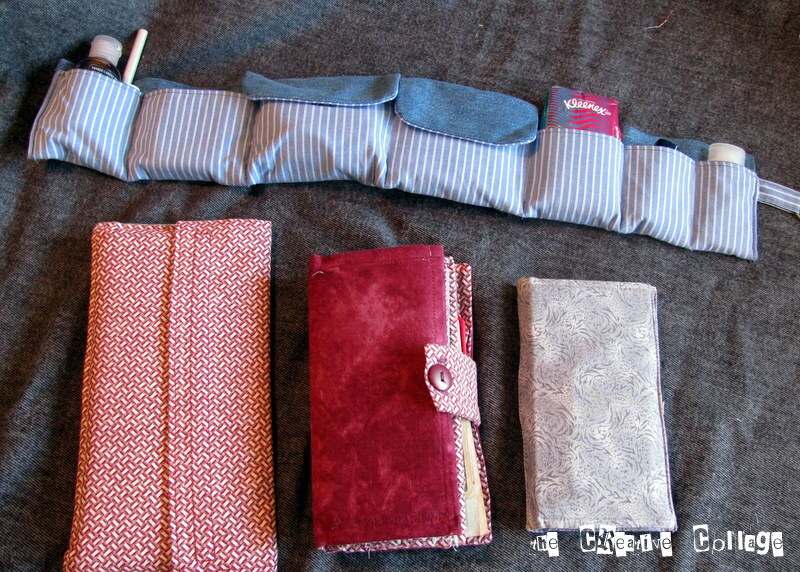 ), tissues and a few closed pockets for the unmentionables. It also has a key fob on it. 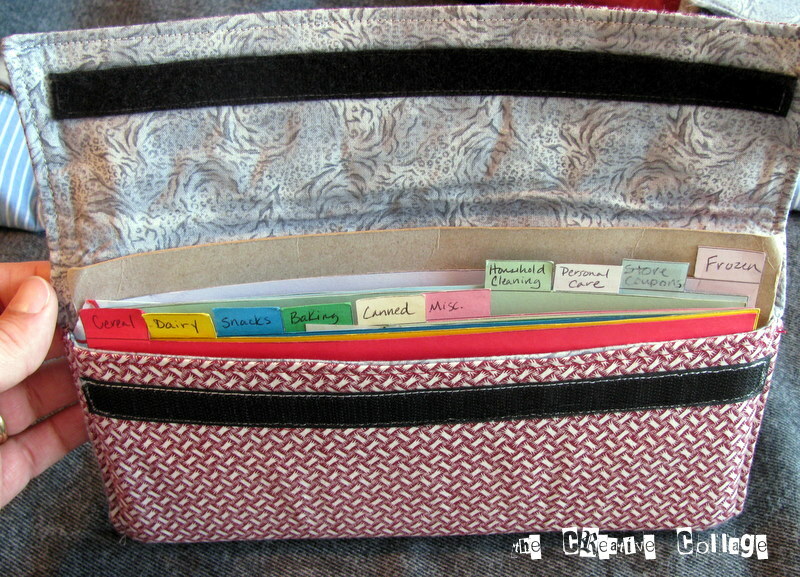 I find that I am using my coupons more frequently after I made this coupon organizer at A Happy Little Family. I did change the categories to suit my needs but otherwise, I just used material that I had. This next thing is a gift card holder. Our school uses a program called Scrip. You can order gift cards in set amounts every other week to a whole lot of stores. The stores have a set percentage amount that goes to your school for every dollar spent. Our school splits the percentage 1/2 directly to our own tuition (private school) and 1/2 directly to the school itself. So, by using the cards to buy things that we normally buy at stores that we normally go to – we earn money! Win-Win! But I needed to get organized so I make sure to use the cards without struggling to find them in the check-out lines. There are 4 different pockets with dividers in each. One holds cards for fast food, one for restaurants, and one for grocery stores and one for other. They also have a full pocket behind the 2 front pockets on each side. Some of the gift cards are still paper so they are tucked in the larger pockets. I added the sharpie to write the amount left on the card after using them and putting them back. Then I don’t need to keep the receipt with the card after it has been partially used. It has been working out great for me! I didn’t have a pattern for this, just sort of winged it using measurements from the cards, etc. The last thing is my double checkbook cover. I carry our personal checkbook (with my license blurred out) and our farm checkbook. Before I had them in 2 separate things and it just made it harder to find in my purse. I also added some pockets for credit cards and cash in the center. My one checkbook cover has a calculator and a pen holder in it, so that was a bonus. Again, I didn’t have a pattern just winged it! It has really cut down on the clutter in my purse also. My organizers are by no means perfect and as you can see above, I should’ve used matching thread, but I am happy with how they turned out and it works for me! Here they are in my new purse. 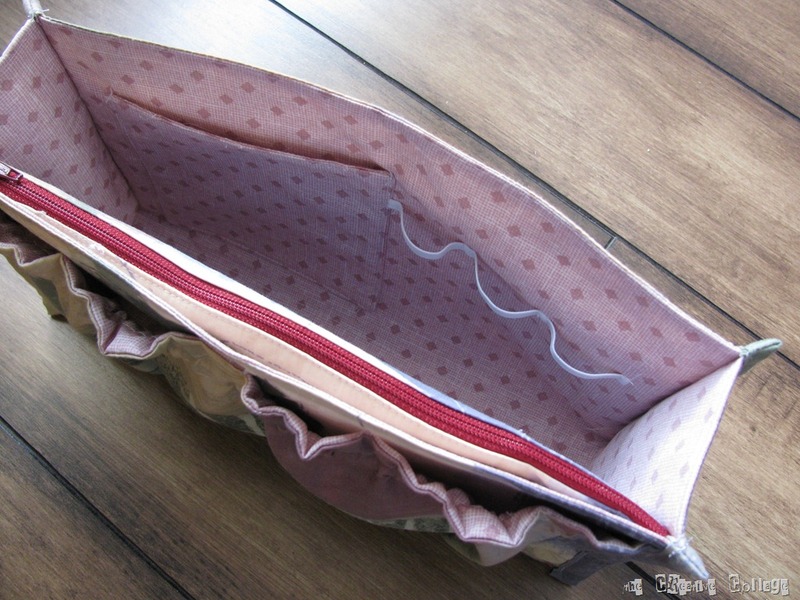 I didn’t have to add any pockets to my purse because I have the removable organizer! So – now I just have to decide where my flower pin will look the best and I’m good to go! UPDATE: I was asked for instructions on how this purse was made. I didn’t take pictures while making this but if you are somewhat experienced with sewing, I think you’ll be able to follow my written instructions! 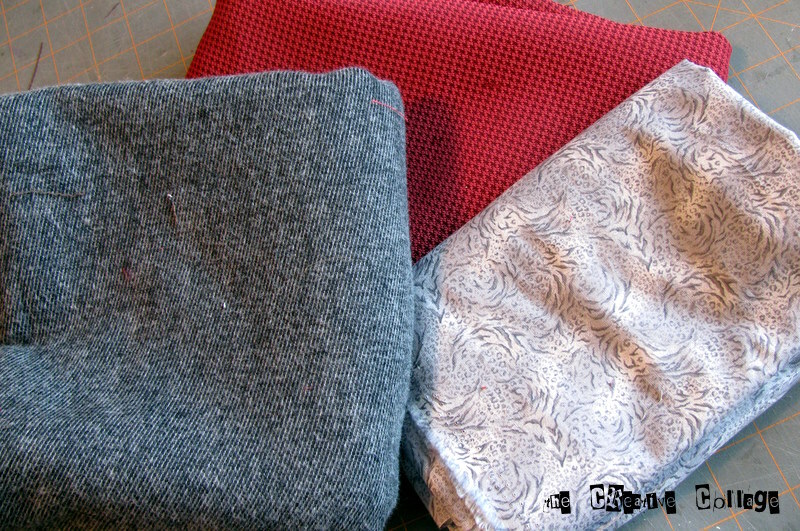 I started with (2) 16″ x 11″ rectangles of the outer bottom fabric (in my case, dark gray). I found the middle of each 16″ side of the dark gray and used a pin to mark it. I then measured 1 1/2″ to the right folding that point in to meet the center pin and pinned that in place. I then measured 1 1/2″ to the left of the center pin – folded that point to meet the center pin and secured it in place. I repeated those steps on the other 10×16 rectangle – stay stitching the pleats near the edge to hold them in place. I then cut a narrow strip – I think it was around 1 1/2″ inches of the red, folded it in half and pressed it well. The band (the lighter gray print) was (2) 3″ x 13″ strips. If you measure the pleated top of your dark gray material, you will be able to adjust the width of the band to the right measurement. It can be plenty long because you can always trim the extra after sewing it together. Then you can sew your light gray bands on each dark gray rectangle, with the raw edges of the red strip you ironed in between. Make sure you hold your pleat as flat as possible as you stitch over it. The next step is sewing both halves of the purse together around the sides and bottoms – matching your bands as closely as possible. Then I sewed a 4″ boxed bottom on each side of the bottom. 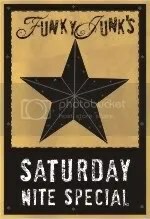 For the lining I cut (out of paper) a rectangle 16″ x 13 1/2″. I marked 1 1/4″ off each side and drew a diagonal line down the side to the bottom 16″ corner. This is the pattern I used to cut out my lining fabric. I used a rather heavy material for lining so I used a lighter interfacing. 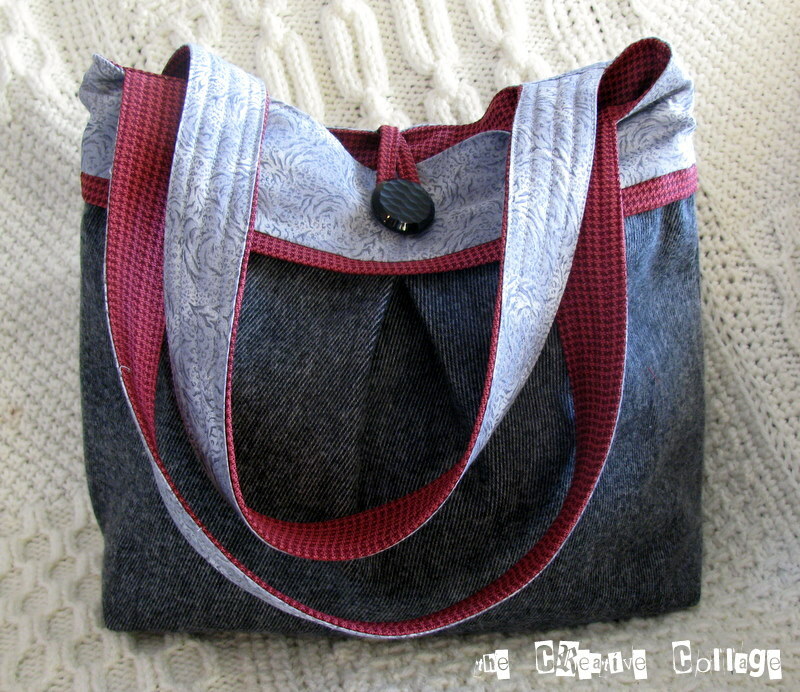 Typically in the past I have used a fleece interfacing for purses. 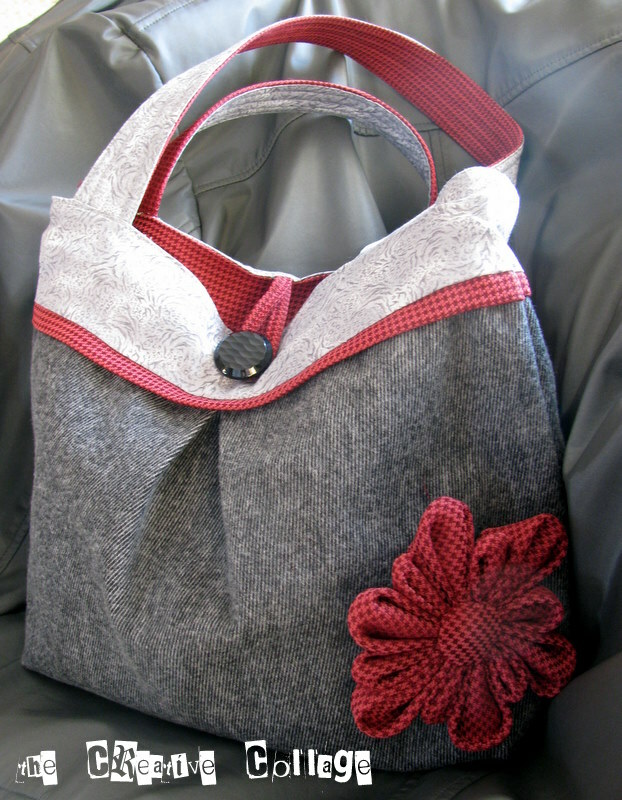 If I had it to do again, I would probably use the fleece just because it gives the purse more body and it sits up nicer! If you wanted to add pockets to the inside, now would be the time to do it! Just make sure you take into account the seams and the boxed bottom for placement. I sewed the side seams and bottom of the lining – leaving a 4″ gap at the bottom of the lining to use for turning. 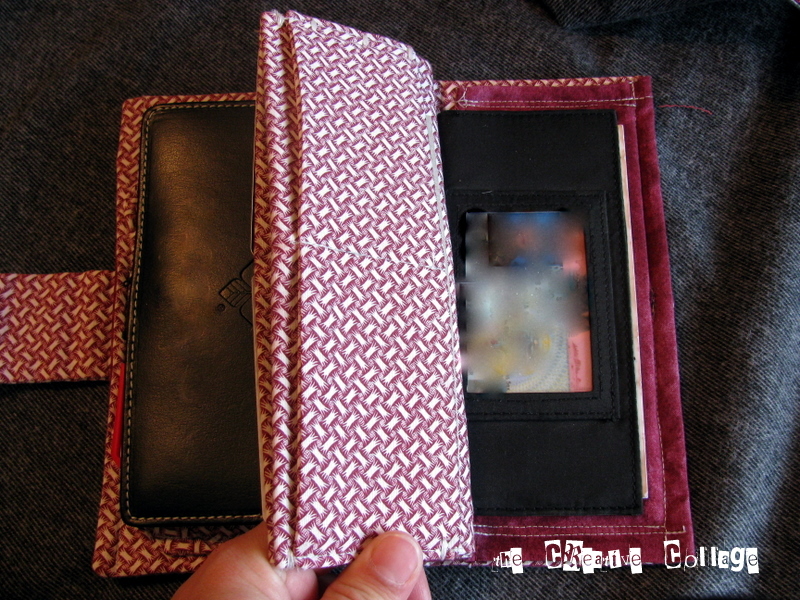 I sewed the same 4″ boxed bottom on each side of the lining bottom also. For the handles I cut (2) 1 3/4″ strips at 22″ of lining and light gray materials. Sew one lining piece to one lt. gray piece “hot dog” style. I added the fleece interfacing – but only in between where the seams were on one side. 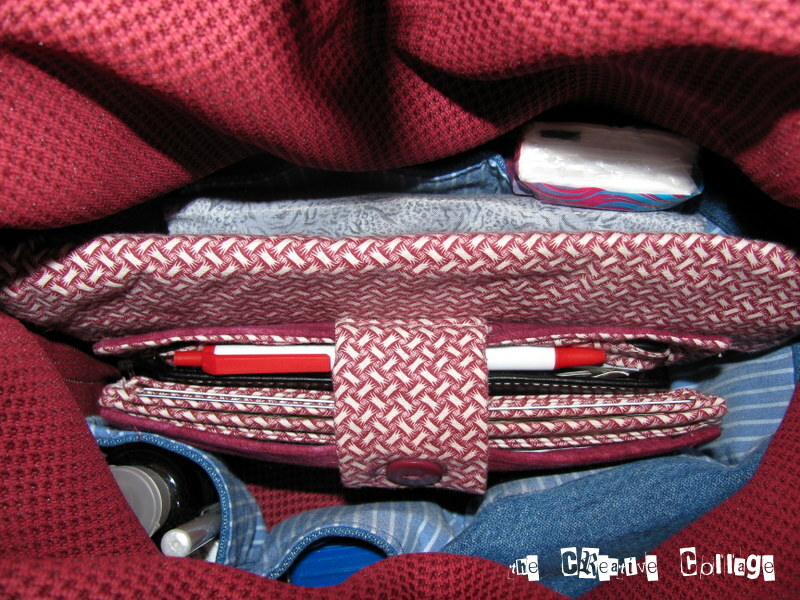 Fold the strap in half and tuck under the outside seams as evenly as possible, ironing as you go. Topstitch each side and optionally 3 more times down the strap. I like the look of the extra stitching, but it isn’t necessary. Repeat for the other strap. For the final assembly, you will need to measure 1 1/2″ in on each side of the side seams of the outside. Pin the handles securing, butting up to the 1 1/2″ mark. Make sure that your straps are not twisted and lay them against the right side of the outer part of the purse. Tuck this into the lining (which is inside out). As long as all the right sides are facing each other, you should be alright! Then stitch around the opening matching your side seams. I usually find the centers of the back and front and match them also. I also double stitch where the straps are just to make it a little stronger. Going through the 4″ gap left open in the bottom of the lining, turn everything inside out. Iron the top flat and top stitch all the way around. You can hand sew the opening in the lining closed – or just top stitch it – no one will see it anyway! Well – that wasn’t so bad, was it?!??!?!? I hope it is understandable. If you take one step at a time I think you’ll be able to follow the instructions. 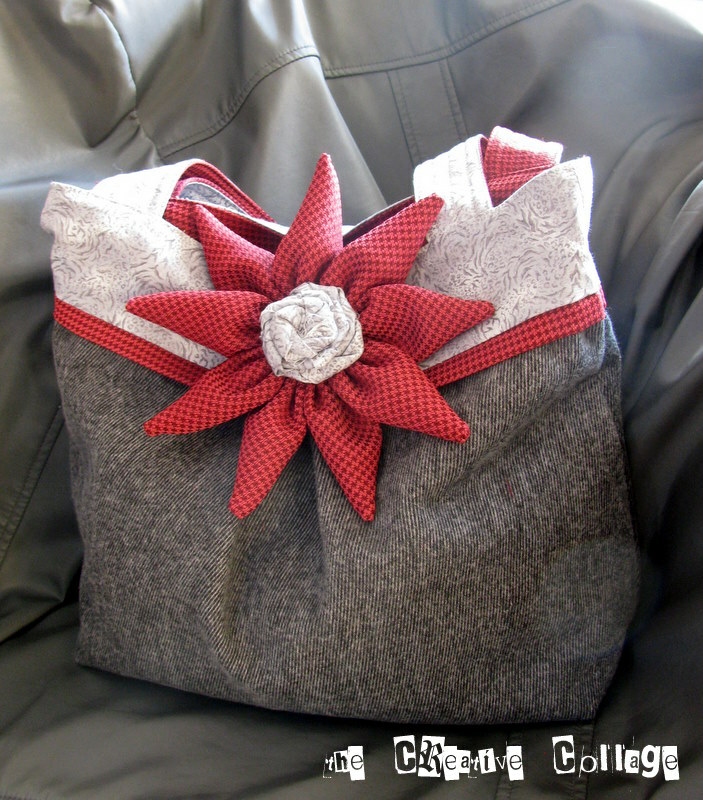 I used a foots-width seam – which is about a 3/8″ seam on my machine. No rhyme or reason – just an easy line to follow!